March 2011 – CREATE. PLAY. TRANSFORM. Greetings From The Mud Pit in Manila! A few more weeks to go and it’s summer time! Kids, Teens, and Adults can join Pottery Lessons with Clay Ave. Please read the newsletter below to know why I encourage you to try it out. See the schedule and reserve a slot as early as now! It’s never too late to try something new. Explore the endless possibilities of working with clay. I encourage people, young and old, to play and get dirty with this earthy material. It is not only fun, but you may discover a new passion too! I hope to see you at the pottery studio soon! Learning the Basics of Pottery Making is not only for kids ages 7 years old. Clay Ave has been busy attending to adults on Saturdays at 10am-12nn and 2pm-5pm. A new schedule for adults is posted on the newsletter above. 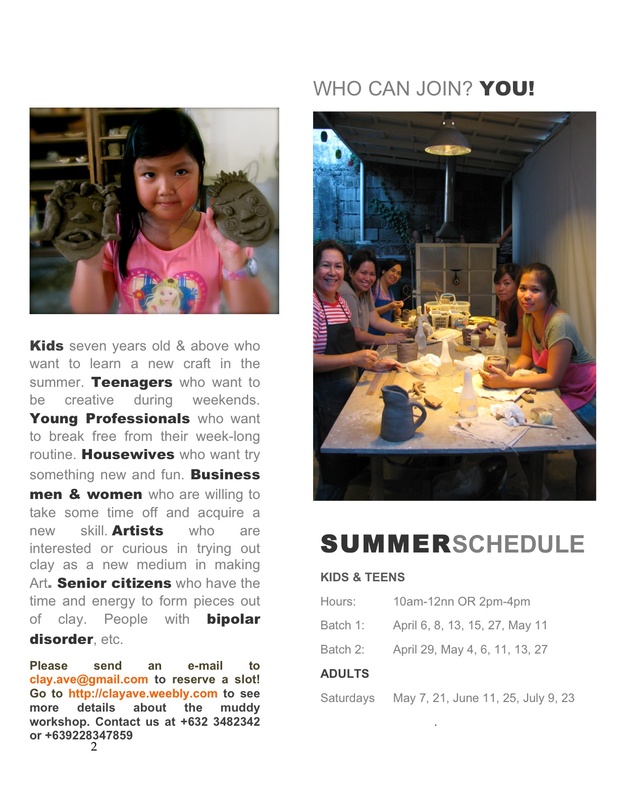 I am very excited to meet kids, teenagers, young professionals, moms and dads this summer at the pottery studio! I find happiness everytime I see my students learning and enjoying working with clay. I have heard some of them say, “this looks hard to make” in the middle of the class. But feeling totally different at the end of each session: happy, satisfied, and excited for the next meeting! I have explored the possibilities of clay and fire with others and on my own. It’s time to share what I know to others. I hope that the transformation in clay will be experienced by my students as well. It’s fun, exciting, and makes one realize that all things are possible with this earthy material. Know why I got so hooked with forming pots out of clay. Age doesn’t matter. You can be as young as seven or eighty years old. Just make sure that you want to get your hands dirty with clay! To reserve a slot, please send an e-mail to clay.ave@gmail.com Please visit http://clayave.weebly.com to see more details about the muddy workshop.